I’ve rarely asked this question. I’ve always believed in my bones that it does. But in exiting paid ministry, in which lives can change pretty dramatically as a direct or indirect result of your work, I wonder not only about the theatre, but about art in general. Who gets their busted lives put back together by art? When I think of my daughter’s quest to act in film, television, and theatre, and the immense difficulty of that journey, when she is frankly talented enough to work her way into what for most would be a far more lucrative career, I wonder if art matters enough to warrant such sacrifice and struggle. The “struggling artist” is proverbial enough to be a bad cliche, yet it is the state of affairs for those who create art that has yet to break through into the worlds of fame and fortune. For a moment, as an exercise, I want to argue the other side. Let’s say art doesn’t matter. I suppose the take in that direction would be that art is largely window dressing. It’s no doubt pleasurable, even delightful, but even if we argue that delight is a good thing, perhaps even a godly thing, then we would assert that some delights are better than others. Surely the delight taken when a child is fed is far superior to the delight taken during a Moliere comedy. Surely the meaning wrought from the experience of caring for the elderly and the infirm is far deeper and more godly than the meaning wrought from a deep reading of, or better yet, a fine production of Hamlet. And to contemplate God directly in prayer is undoubtedly far superior than the contemplation of a Rodin or Rembrandt. Reading scripture trumps reading the greatest of poetry any day. A bowl must be made. Make a functional bowl that will hold water and other stuff, but do not decorate. Do not take the time to deliberate an iota over the shape, size, color, or texture of the surface. That time is better spent. I hardly know how to make the argument. How about this one: Jesus didn’t talk about art, except to say that the Temple would be torn down, and the Apostle Paul didn’t think highly of women who were artfully gussied up. And yes, Jesus told stories, but he was only concerned with the moral behind the story, and not the story itself. Besides, he didn’t craft them, as in workshopping them and redrafting them…he just told them, perfect structures from the get-go. So the lesson there seems to be not to worry about much except the moral. Surely if you focus on the moral, how the story that delivers the moral gets told…well, God doesn’t really care about the quality of that. Just get the moral lessons out there. And Jesus never delivered them with any sense of theatre. He was teaching simply and straightforwardly. We should do the same. Anybody’s life been changed by a painting lately? Sure, art matters, maybe…but maybe not too much. Perhaps we should spend time composing songs and writing plays after the hungry are fed. But oh, you say, you should compose and write in order to feed the hungry. Oh, I see, art making is justified by the ends and uses to which it leads. A song that leads to benevolence is welcome. A song that leads personal profit? Not so good. So I’m an artist sitting at home, my kids clothes’ are getting worn, our food is less than it might be, and the strain is starting to show itself in my marriage. (Remember all this is hypothetical, right? My marriage is great, just so you know.) Art doesn’t matter. Taking care of my kids does. I may be talented, even gifted in my field of art-making, but there’s no market, and the sacrifices are just too great. Art doesn’t matter anyway, and no one will miss the works of art I might have made. Why couldn’t I have been a computer developer? Then I would have been some use to the world. If there’s someone out there who thinks art matters, tell me about it. Somehow I stumbled down a path involving musical art long ago. You, my dear Jeff, were one of many good people encouraging me and challenging me. When I stop to think of what I would do if I didn’t do this…I have no answer. After all these years, I still love being in music, which is my art and my career. Does it matter? To me, yes, oh yes. For though it is my work, it never feels like work. 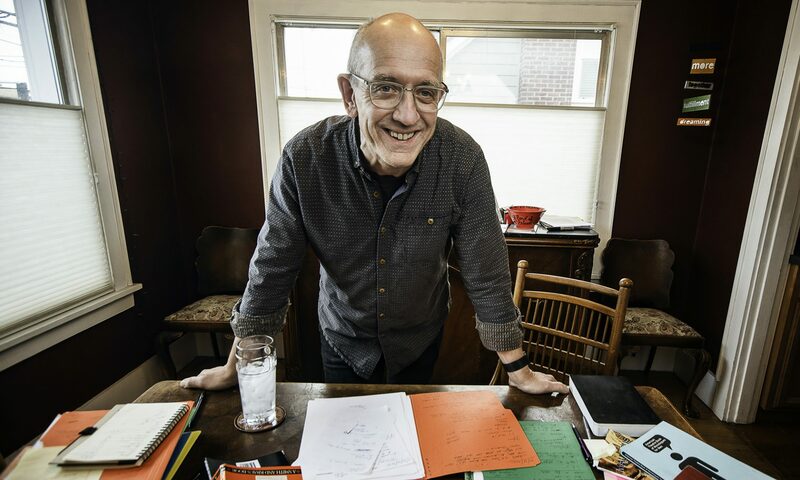 It’s crazy and long and funny and puzzling and solvable and I’m still digging it after, oh, thirty plus years of playing the piano in front of people. And Jeff, you should know, because of you and the good people that let me sit at the piano and figure out this whole theater thing…I feel it a duty to pass on the goodness to the young ones that I work with. It’s the very least I can do to honor good folks like you. You matter to my art. Elaine, how great to hear from you. It thrills me to think of you out there banging away on the keys. I remember how fun those days were, and that you were an enormous help and encouragement to me. I’m glad you’re playing in just the way you always wanted. It means the world to me to think I had a little part in the good you’re spreading in the world. P.S. My tour will be in Seattle early next year. Come see me if you can…I’m out with Grease. I’d love to see you! I remember a 7 year old girl who grew up in the middle of nowhere, surrounded by chaos and well meaning but ill-equipped and wholly unreliable adults. She was sensitive but positive. Trying in her little way to navigate what seemed like a monstrously unkind world containing too much violence and neglect. A world where promises weren’t kept and reality was easy to escape … but only if you were old enough to drink. An aunt gave her a collection of young adult literature, she visited an art museum with her school and was transfixed by a Diego Rivera mural, her mother sang her songs that were passed down from her grandmother’s grandmother. Through these glimpses of beauty, she senses that there must be a reality beyond the one that she knows first hand. She begins to sense that even though the truth inside of her doesn’t match the world she knows, there must be an environment where the truth inside of her is really … true. And when she writes, or draws, or walks through the forest singing, the oppressiveness of the world is lifted from her for a few moments at a time and she feels safe and happy and she knows that somehow, somewhere, there is possibility. So she doesn’t give up. She survives. She perseveres. She grows up and tries to shed light on Truth and Beauty in whatever small ways that she can. And while Louisa May Alcott and Diego Rivera and some unknown ancient songstress didn’t put clothes on her back or put food on her table, they may have saved her life. I don’t know you, but I want to thank you for these words. As an artist who struggles with this very question – knowing that art matters, deeply, yet sometimes finding it hard to remember why – I find great comfort in your words. This, of course, is why it matters. Great to hear from you Darren. You know my son is in London right now? Studying at LAMDA for the semester. I know, I should have come to see him, and I could say hey to you, too. Well, in the future. When do you finish the MFA? I’m with you on the Impressionists. I remember running into them for the first time at the Art Institute in Chicago. Stunning color! Was totally wowed. And yes, God is there. There’s a great book by a Jesuit guy who speaks pretty densely and beautifully about the call that comes through beauty that reveals the divine, and at the same time opens an abyss between us and the source. It’s that thrill and the ache combined. I so get that. Would love to hear about your program sometime. Physical theatre. Love it. Very cool. You must come see me! I actually finished my MFA back in 2005 at The London International School of Performing Arts – LISPA for short. It was founded by the former head of Ecole Jaques LeCoq. I’m now teaching there, where I get to teach Space Lab. It’s the world of design, spacial awareness, puppetry and object manipulation (sort of animation in the broad sense). I also do free-lance design, puppetry, building and directing. On the Physical theatre side, I never really connected with the whole Stanislavski thing. I discovered the ability to get to the same reality from the other direction and it changed my life. One of my co-teachers is also at LAMDA teaching the LeCoq portion. I’ve been thinking about your posting all day. It hit me that one of the most important roles of art is sheer communication. We all have a desire to be understood. Sometimes, art is the only language we have to convey our deepest, truest meaning. Sounds like really cool stuff you’re up to. Are examples of your work online? Are you in London for the long haul? Communication. Yes, I forget that sometimes. Sometimes expression and communication fight with each other, just like in regular conversation. Sometimes I just want to express what I want to express in the way I want to express it whether it communicates or not. Doesn’t usually go very well…. “How beautiful are the feet that bring good news”!! SO after reading this, I went out and made breakfast. As I guzzled down some orange juice, I reflected on how much I love the TASTE!! And it got me thinking (again) at how God has created this world in such a way– simple survival (from an evolutionary model for instance) doesn’t really require things like beauty, glory, love, etc. But this world is saturated with those things as a testament of a powerful, personal God who loves with a real, intense, creative love, and is always (as I like to say) “showing off” His creation. Does the orange juice have to taste so GOOD?? Maybe not– it would serve it’s purpose without my enjoying it so much. But a pill just doesn’t stimulate the senses, now does it? He made us able to create and to appreciate the His creation. How stale and LIFE-LESS would life be without the beauty and pleasure , and even God takes delight in things. Note the metaphor that sacrifices are a “fragrant aroma to Him”. Yeah, I agree. But go another step. We look at the sensory dimension as “extra”, added on, unnecessary. But what if that’s where we’re wrong. What if the aesthetic dimension of survival IS survival, or a vital, needed part of it. Truth is, what it means to be human would be vastly different if God had chosen to not make the sensory realities we enjoy. What if He’s not showing off, but simply building life with beauty because its what life requires? What if spirit needs flesh, and its not extra. So that God create a whole human being, not a parsed out human being. What if death is the separator, and in the resurrection body, sensation is restored. What would survivability in heaven be for a human with no taste, no sight, no hearing, no feeling, and no smell? It would be something other than human, which I think, the Bible teaches is both our origin and our destiny. Not sure I’ve ever said it like that. I agree with where you’re going. I used survival in the purely scientific sense (exclusive of God), but I don’t subscribe to them being separate from one another. We ARE what we are because God made us this way and He thinks it’s good! People have forgotten about their hearts…. Beauty makes people fall in love. Love that feels good, mem’ries, first kisses, stuff we want to do. joy. I think that art allows us to “show” people truths and meanings of the gospel that have grown stale in 2,ooo years in a new way. I think somethings have gotten lost. Many Christians love money, many Christians go to church but are bored with it, they go out of duty, many Christians have too many shoes and clothes and stuff and aren’t concerned, many Christians are polluting the planet and living out their lives in a sofa chair waiting for God and death to take them to some unknown castle on a cloud where they can be reunited with grandma and ask questions of their favorite superstars who have died. Things have gotten messed up. Salt of the earth. what does it mean? And what about all of the good hearts who have become disenfranchised because of harmful messages from the towering pulpit? We are never going to find the plot again unless the plot looks fresh and lovely. So we give them Beauty. the kind they want to see. ……hearts on fire. I am thinking from the heart of an artist and the education of a health professional….I believe that there is so much that we don’t understand our bodies and how they function and how they survive…and from that I believe that beauty, art, sensory stimulation are all necessary for survival. We may see them as extra but I see them as a part of the whole experience of being human and spiritual and maybe the sensory part is our biggest spiritual connection. Just thinking aloud….. I happen to be a software engineer, and at one time in my life, believed that fulfillment would come from creating wonderful programs that would do amazing things; but like many other things in life, the reality of the day-to-day bureaucratic managerial emphasis on budget and schedule and costs and lean processes with casual lip service to quality and elegance and yes, Art, stifled any satisfaction which might’ve come from this area of creativity. My sole remaining outlet is music, singing to God as I lead the children’s worship at church; it fills my soul with peace as no other expression can do. This Art, the crafting of lyrics to notes, the purity of melded melody with harmony, the expression of adoration from the one created to his Creator, allows me to endure the mundaneity of a daily existence which provides little or nothing in return. Without Art, I feel as nothing more than a cog in a pointless wheel. Art is what speaks the language of the heart, and the heart is what changes a person. Art is a way to directly access the heart of a person in a way that no sermon or formal exercise can. And when it speaks to the heart, it remains there long after the sermons have ended. Sermons may shape in little bits when they happen to be relevant, but art presents a fully developed form and has the ability to affect the very form of the observer. Reminds me of reference variables in C++… for those of you who write programs. My guess is that asking what use is art to the world is like asking what use is the world to the world, or what use is anything to anything? I think, some things are beyond. Beyond finite or acute explanation. For me our experiences are diffuse, dimmed by the limits of our perception and art, be it constructed or not, may remind us of a kaleidescope of color and experience beyond what is immediately grasped by our perception. Art lets us know empirically that reality is forever disguised by the limits of our perceptions. My short answer is yes, art matters, deeply, passionately, without doubt. Who would want to bring life into this world, to nurture and care for a young life born into a world without art? My example: In the late summer 2010 my wife and I were in a losing battle to make a pediatric practice work on Orcas Island, a magical community that we desperately wanted to make our home. We were creating what you might call a “functional bowl,” and I can say without too much humility that we helped a lot of children, maybe not by feeding them, but by helping them live healthier and happier lives, and in a few cases longer lives. But alas, the finances didn’t work and we were sliding into bankruptcy and financial ruin in the process. 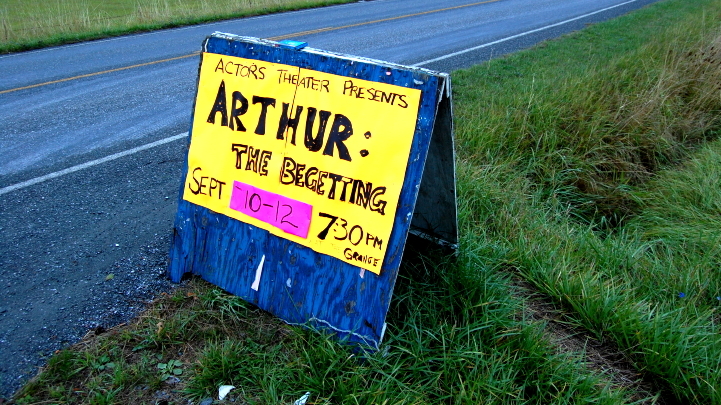 Along came the opportunity to participate in the play you have pictured above, the Grange production of Arthur: The Begetting. My wife played Igraine, my daughter Anna, and I played the role of Uther. And in that process, when our dream was turning to ash all around us, we got to play these beautifully wrought, complex characters in an epic story of love, power and loss. It transformed us, and created an unforgettable experience for friends and strangers. It reminded us that larger forces were at play in the world, that the cracks in our functional bowl were part of the story of the human spirit. It had meaning, and a year later it still does. Thank you for your art. Your play cast brilliant light into a dark part of our lives, and we are changed for it. Thanks so much for this note. It means the world. We are a year now since that post was written, and I’ve been struggling along writing a play that is an unwieldy sort of thing, and it’s easy to get discouraged. Then along comes a note like this and it points me again toward the mysterious ways in which God weaves His way (and ours) through the world on the sly. I’m thrilled that I got a chance to play a small role in your journey. Thanks so much for taking the time to share. So what are you guys up to now?